Johan de Nysschen thrives on turnaround strategies. 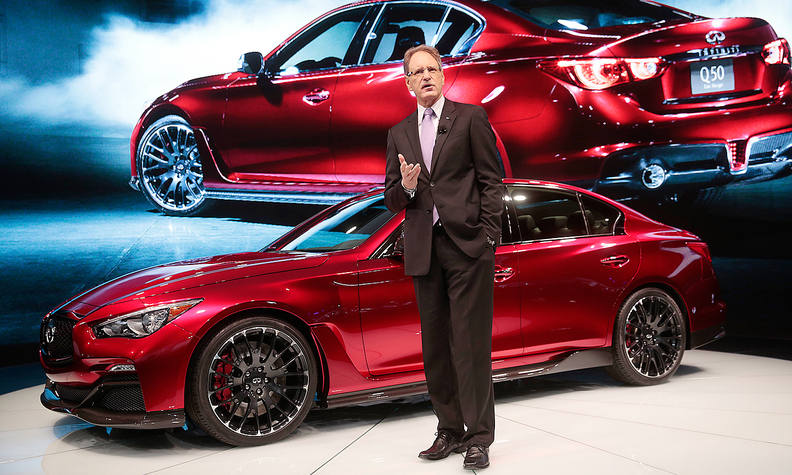 TOKYO -- Johan de Nysschen, the former Audi executive lured away by Nissan CEO Carlos Ghosn to jump start the Infiniti luxury brand, is leaving the Japanese carmaker to become president of General Motors' Cadillac brand. De Nysschen, 54, will take up his new post Aug. 1, reporting to GM President Dan Ammann, GM said in a statement today. De Nysschen said in the statement that his aim is to restore Cadillac to its place among global premium brands. GM President Dan Amman said in the same statement that De Nysschen "brings to our company vast experience in the development and proper execution of luxury automotive brands. His track record proves he is the perfect executive to lead Cadillac for the long term." The appointment of de Nysschen fills a leadership void at GM’s luxury brand. Cadillac chief Bob Ferguson has been focused on GM'S recall crisis, U.S. Cadillac boss Bill Peffer departed abruptly last month after less than 10 months in the job. He was the third head of Cadillac sales to leave in two years. Ferguson is returning to his previous position as GM’s top government lobbyist, effective immediately, GM said Thursday. Since mid-March, Ferguson has been spending most of his time in Washington, helping to steer GM’s response to its ignition switch recall. De Nysschen’s departure comes just two years after he joined Infiniti at its new global headquarters in Hong Kong on July 1, 2012. In deciding to leave Infiniti, Nissan Executive Vice President Andy Palmer said de Nysschen "cited ... a strong desire to go back to the United States for personal reasons,” and noted that his home and family are still in the United States. Nissan is considering internal and external candidates to replace de Nysschen, Palmer said. In the interim, Palmer will assume de Nysschen’s duties as president of Infiniti. The move casts uncertainty over Infiniti at a critical time when the brand was just starting to gain traction, through steadily climbing sales, a series of new product launches, a new dedicated staff and plans for a new factory in Mexico. Indeed, just this week, Infiniti announced that it sold a record 101,220 new vehicles globally in the first six months of 2014, up 30 percent from a year earlier. The brand broke monthly sales records in April, May and June. Volume grew in 31 markets around the world, including key markets such as the U.S., China, Canada and the Middle East. To be sure, de Nysschen, helped deliver that success. But sales are far from the 500,000 annual units his boss has demanded for 2020. And the brand still trails Japanese rival Lexus, not to mention the three German brands -- Mercedes, Audi and BMW -- against which Infiniti publicly benchmarks itself. At Infiniti, there was plenty of building to do. His task was to cleave Infiniti away from its mass-market sibling brand Nissan as a stand-alone luxury marque. The relocation of Infiniti to Hong Kong happened just months before he arrived, as the brand symbolically left the nest it shared with Nissan at corporate headquarters in Yokohama, Japan. His first step was to populate the fledgling spinoff with its own dedicated personnel. Infiniti, which long pulled from staff doing double duty on the Nissan brand, got its own product planners, engineers, designers, regional heads and human resource team. The South African executive also championed building the brand’s lineup, tapping new overseas markets and leveraging joint projects with Infiniti’s German partner, Mercedes. Just last month, Nissan and Daimler unveiled plans to spend 1 billion euros ($1.36 billion) to produce 300,000 compact Infiniti and Mercedes vehicles a year at a new factory in Mexico, starting in 2017. That announcement followed the opening of an Infiniti and Mercedes engine factory in Decherd, Tennessee, which makes engines for the Infiniti Q50 and Mercedes C class. Ghosn recruited de Nysschen for his record of hard-charging results as president of Audi of America. Over his tenure there, Audi’s share of the U.S. luxury market climbed to 9.5 percent in 2011 from 5.3 percent in 2004. But de Nysschen has sometimes been at odds with Ghosn’s own ambitious targets for Infiniti, quietly dialing them back. Since then, the timeline was quietly pushed back to 2020. He also delayed the rollout of an Infiniti brand electric vehicle. At the 2012 New York auto show, Infiniti unveiled a five-passenger LE concept electric sedan. Then in December 2012, the brand said it would launch an all-electric Infiniti -- the brand's counterpart to the Nissan Leaf -- in 2014. Last year, de Nysschen said the project was on hold now. De Nysschen aimed to plow Infiniti’s limited resources into projects with bigger immediate impact, such as starting production in China and the United Kingdom and shepherding the launch of volume nameplates, such as an entry-level Q30 compact. De Nysschen also advocated at least two halo nameplates above the current flagship Q70 sedan. Offering the first public details on those plans, he said those cars will appear by 2020 and be based on the same platform. Infiniti long struggled against an unfavorable exchange rate that ate into the profits of its Japan-made nameplates. Indeed, Ghosn said last year that Infiniti's contribution to Nissan Motor's operating profit was “practically erased” in the previous two years by the strong yen. But the sharp weakening of the Japanese currency since last year has helped to greatly shore up margins. Word of De Nysschen’s departure comes just days after Infiniti named longtime BMW executive Gaby-Luise Wuest as its head of global operations, succeeding Francois Goupil de Bouille, whom Infiniti appointed as head of Europe, Middle East and Africa. Wuest was most recently the regional head of BMW's Mini operations in the Asia-Pacific region and South Africa. Starting Sept. 1, Wuest will head Infiniti's sales and after sales, fleet sales, retail network development and product training.